I joined a second dojo a few weeks ago. The teacher there has extensive experience with boxing, Brazilian Jujitsu (what you do once you’re on the ground for newbies like me), and training students for the sport of MMA. He knows I’m not there for the sport, but the real life applications, and throws me an additional insight from time to time (“here’s what you’d do if you are on concrete…”). The other aspect I like about this second dojo is the emphasis on full speed, full contact. With fairly complete body armor and *lots* of verbal communication with your partner, we can safely ramp up the sparring while staying in a learning mindset, avoiding that triggered reaction of closing off your mind and going into fight-flight mode. I’m beginning to think of this less as “self defense” training and more of “self offense” training. Given the scenarios I’m training for (someone trying to abduct my child, etc), my objective is to hit first, even though I am the second to move. A professional trainer named Jerry Lee Peterson came up with this concept first, I think. The idea is the the Bad Guy(s) have made the first move, but through superior conditioning and training, I am the one to land the first significant hit. Similarly, Paul Evans explains that self-defense is very different than a counter-attack. A defense merely delays the oncoming attack from overwhelming you, whereas a counter-attack stops the attacker by attacking him…which is quite different than defending against him. Am I ditching my first aikido-based training? No way; it is still the foundation of everything I’m doing, given it’s pure focus of diffusing the negative situation with a positive outcome. How could potentially disabling someone by smashing them in throat and then nuts for a quick “stun and run” be considered positive? Because it is better (legally, ethically) than the alternative. There is a reason the police train in aikido tactics for control and restraint. Now that I am spending more time on BJJ, I’ve found some interesting thoughts that BJJ instructors are saying about aikido and how one flows into the other. You can see it in Roy Dean, who holds a black belt in both aikido and BJJ. And Ari Bolden, who holds a black belt in aikido, Japanese Jujutsu, and a purple belt under Eddie Bravo. These are genuine Brazilian Jiu-jitsu practitioners demonstrating an appreciation for aikido. That’s got to say something about the art. Ouch. Bruises in odd places. Posted: October 14, 2009 | Author: Scott James | Filed under: 7. Physical Security | Tags: emergency preparedness, martial arts, MMA, prepper, self defense | Comments Off on Ouch. Bruises in odd places. Nothing like training on mixed martial arts with a bias towards real self defense to help you discover new ways to bruise your body. 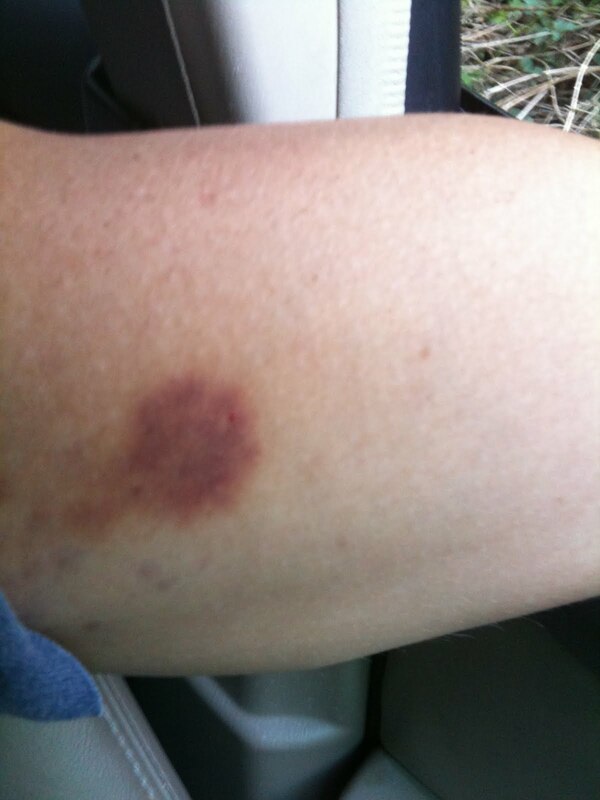 This bruise looks suspiciously like the thumbprint of my sensei. Re-engaged with a new (old) teacher for physical security training recently. I’ve known this fellow for years, trained under him awhile ago, and trust him to teach me these potentially deadly techniques with the correct mindset. Specifically, one of being positive and solution-focused. He was open to contracting with me for private lessons in a customized format, makes my dojo commute time only 15 minutes (by bicycle) each way, and meets with me during my lunch break. Cool. 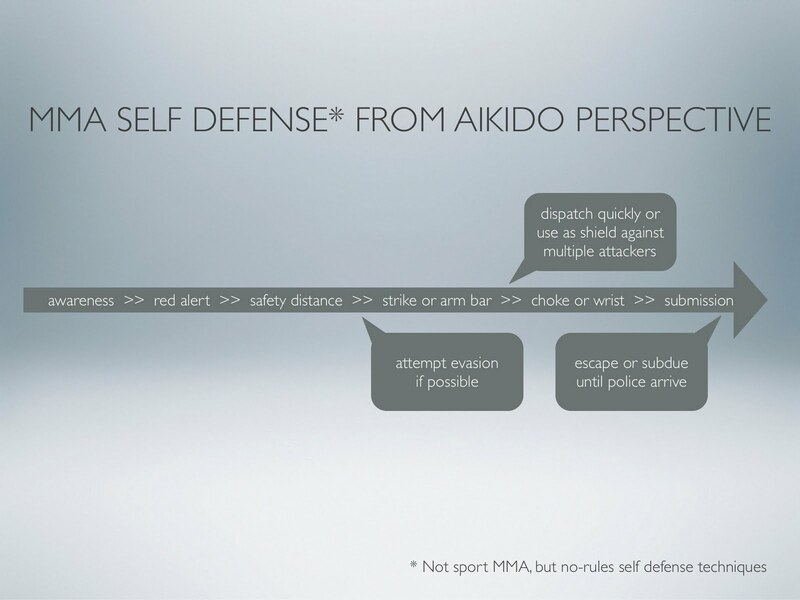 We’re studying the same practical topics as krav maga (unarmed defense against chokes, strikes, kicks, knife, and gun), but from an aikido perspective. Aikido is known as the only martial art that is non-aggressive. 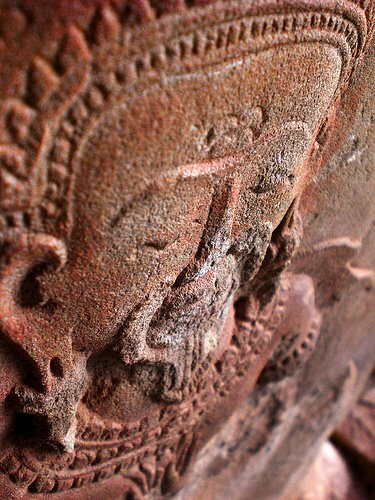 While I appreciate that fact because I believe in seeking harmony, it also leads to criticisms of the art. We are attempting to remedy these critiques by bringing in portions of other disciplines, such as Brazilian ju-jitsu (ground work/escape), Wing Chun (close combat), and Muay Thai (striking/kicking distance), with a focus on simultaneous defensive and offensive maneuvers. 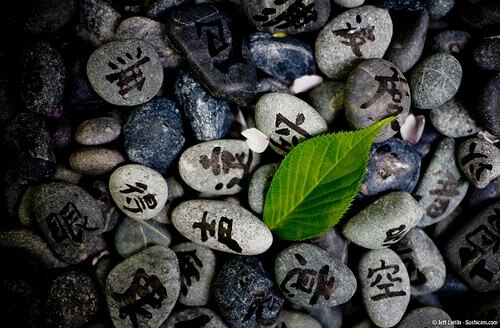 Because all aikido-based techniques wait until the other person attempts to do something negative to you before responding, it is great for diffusing potentially negative situations. But in case they can’t be diffused, I’ve added weapons training to my sessions for the jo, kubotan, and stick fighting. Why those specific weapons? Because I already carry them every day. A jo is basically a long stick. Between hiking sticks and garden tools, I spend a fair amount of my day with something like a jo already in my hand. A kubotan can be any small cylindrical object. For me, that’s the space pen, small tactical flashlight (during travel) , or pocket multitool (not during travel) that are always in my pockets. The fighting sticks are martial arts version of a policeman’s baton. I keep a collapsible ASP baton attached to my bedside so I can sleep better. And why weapons training at all? Because a recent discussion with my wife made it clear to me that I will never be allowed to store guns in our house, loaded or unloaded. Scratch that, once the local coyotes and raccoons started attacking our chickens, guns made it onto the approved list. But this logic still applies for those (many) times when I am not armed. I can usually find something nearby to serve as a stick. I do not disagree with any of her arguments; I could make all the same arguments myself. But it convinced me of one thing. If I cannot have a “weapon” in the house (e.g. a gun), then I need to become the weapon myself. Which is going to take *alot* of work. This part of my Physical Security task overlaps with my Personal Training task. Much of physical security is centered on hardening my home to burglars and would-be home invaders, but a portion of this task is the hardening of myself. Like many other parts of the Personal Training task, I’m now making up for items I wish I had learned as a youth or young adult. Things like how to solder, how to use a plumb line, or how to disable a person(s) attempting to hurt someone I love. It’s this last item for which I’ve started conditioning recently. I’m now studying martial arts for the first time in a focused, supervised manner at a local dojo. My primary focus is how *not* to get in a fight; how to deescalate any situation that might cause someone to physically attack you. But part of martial arts is also focused on how to efficiently and effectively disable someone threatening yourself or your family. Even though we train at speeds well below full speed, I’m going to be lucky to get through this training without breaking my nose at least once.